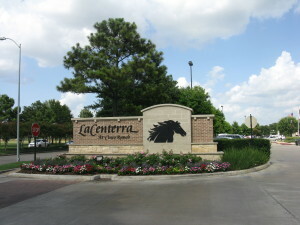 LaCenterra at Cinco Ranch is a 34-acre, 300,000 square foot Main Street style mixed-use development located on the western edge of metropolitan Houston in Katy, TX on the Grand Parkway three miles south of Interstate 10 with prominent freeway visibility. The property is nestled in the heart of Cinco Ranch, one of the nation’s top-selling master planned communities for the last seven years. This entry was posted in People and Places, Real Estate. Bookmark the permalink.